If you find the need for Armed Forces photos and art, here is the place to look. Regardless of your opinion about their present mission, the military does present a spectacular visage. 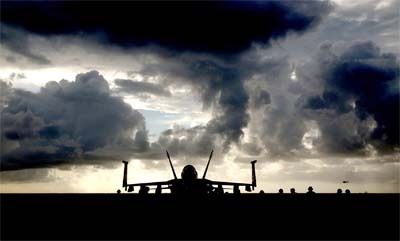 "06/17/06 - An F/A-18E Super Hornet aircraft sits at the ready as storm clouds pass overhead aboard the Nimitz-class aircraft carrier USS Ronald Reagan (CVN 76) in the Philippine Sea June 17, 2006. All of these files are in the public domain unless otherwise indicated. However, we request you credit the photographer/videographer as indicated or simply "Department of Defense." Do you remember all of the clip art that was available locally with Office XP? A small amount of sample clip art images was included The 2007 Office systems and Office 2003 and is part of the "local collection" that is searched when you do not have Internet access to the Microsoft Office Online Clip Art and Media Web site. Office 2003 no longer included a media content CD with additional clip art. However, the Microsoft Office XP Media Content CD can still be installed locally or on a network share. The Office XP Media Content CD contains approximately 35,000 clips that are a subset of the clips that are available on the Microsoft Office Online Clip Art and Media Web site. The Office XP Media Content CD was included with Microsoft Office XP Professional, Microsoft Office XP Standard, and Microsoft Publisher 2002 Deluxe Edition.